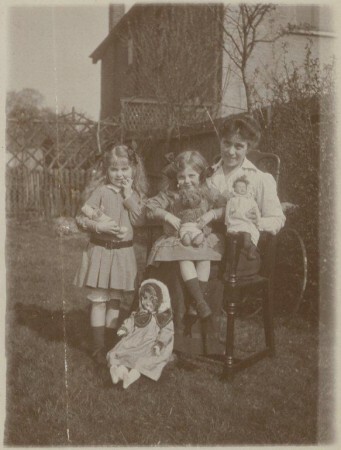 Beryl, left, with her mother and sister. 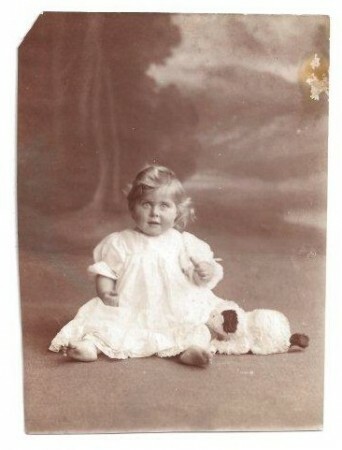 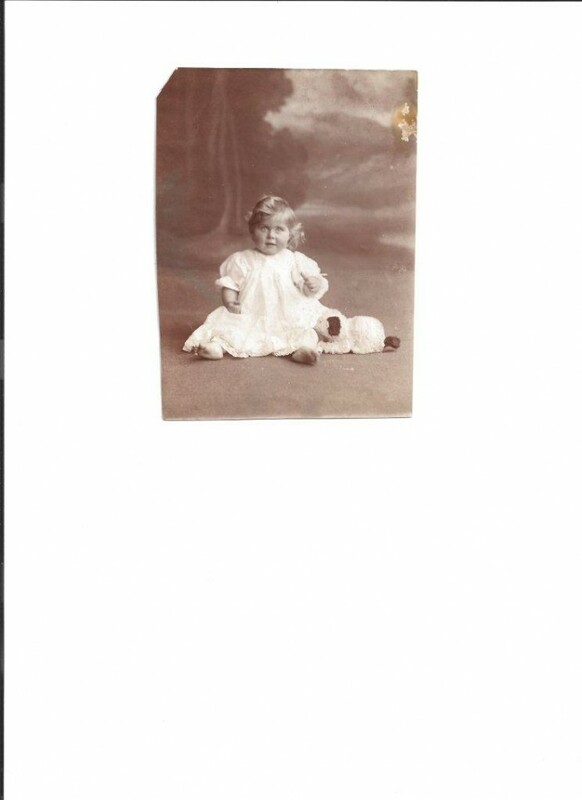 One of her earliest memories - Stitching clothes for her dolls. 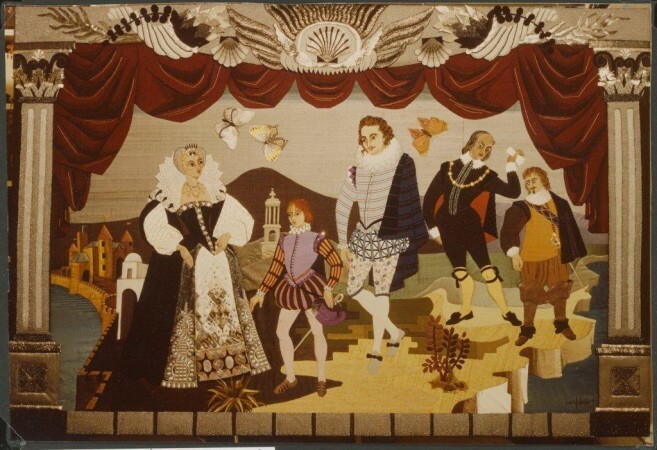 Royal School of Needlework Distinction for final examination piece. More information. 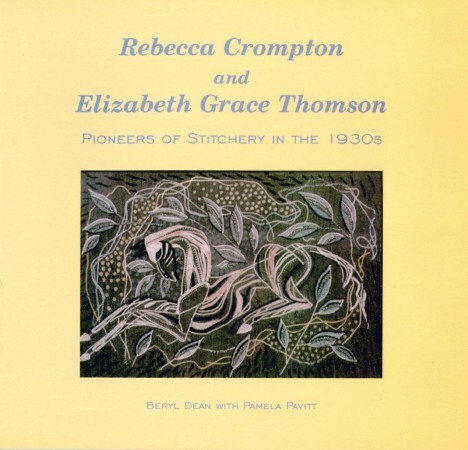 New influences: Rebecca Crompton and Elizabeth Grace Thomson. More information. 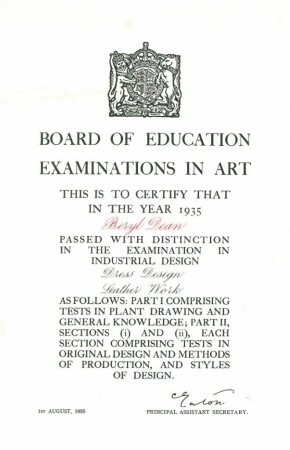 Won a Royal Exhibition Scholarship to study at Royal College of Art. 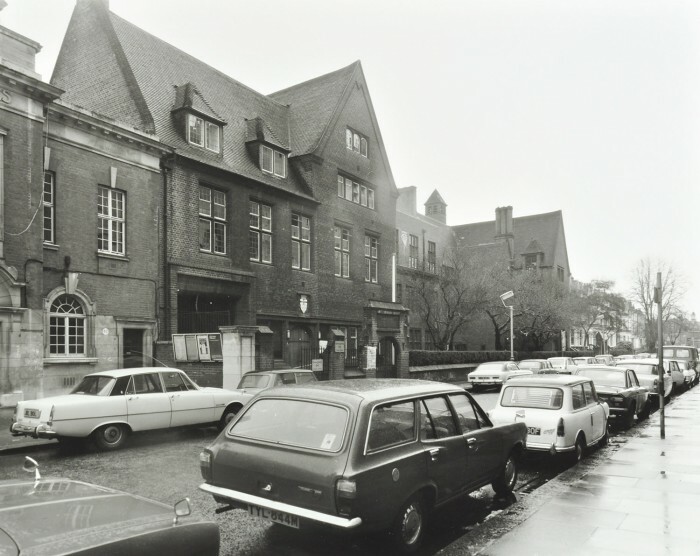 Until 1960 the RCA did not have its own premises. 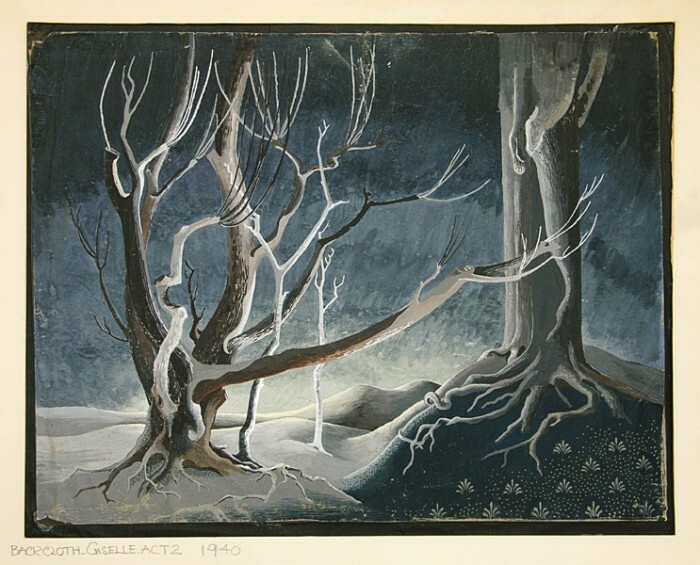 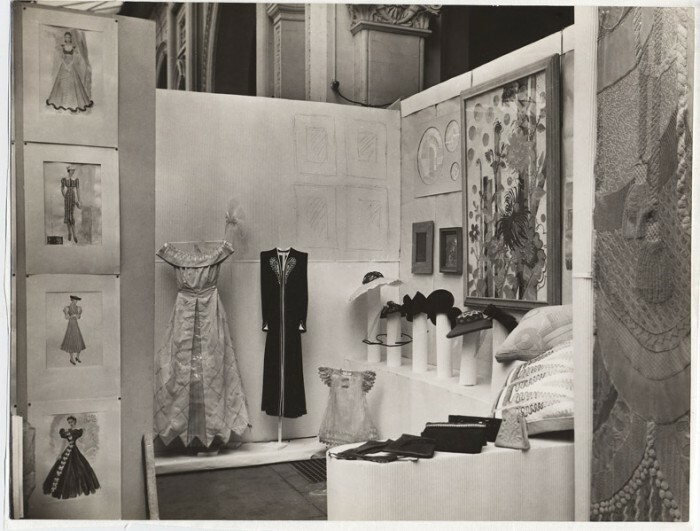 In 1930s it was based within the V&A Museum Building. 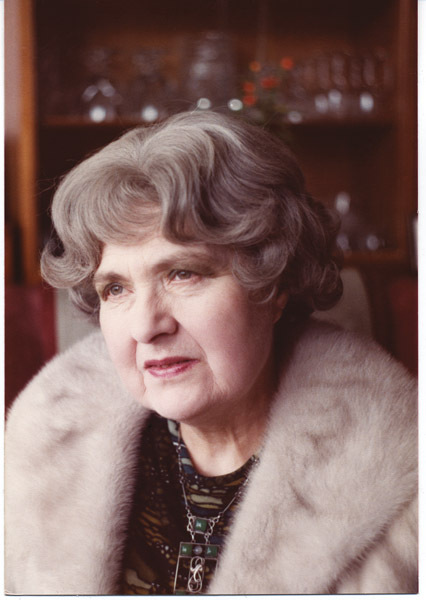 Head of Women's Crafts, Eastbourne School of Art. 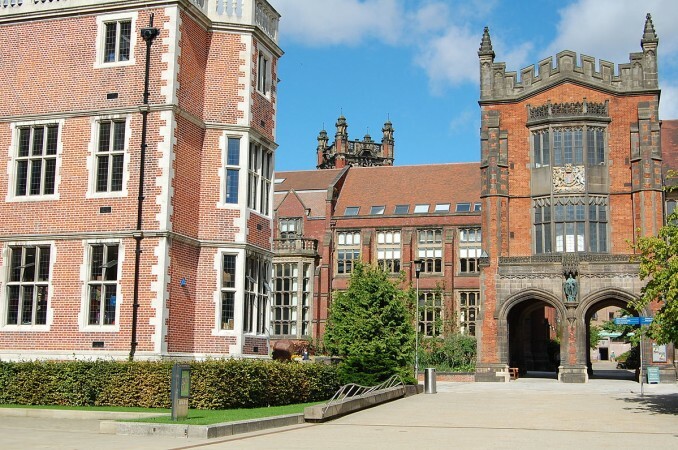 Senior Lecturer, Department of Fine Art, Kings College, Newcastle, University of Durham. 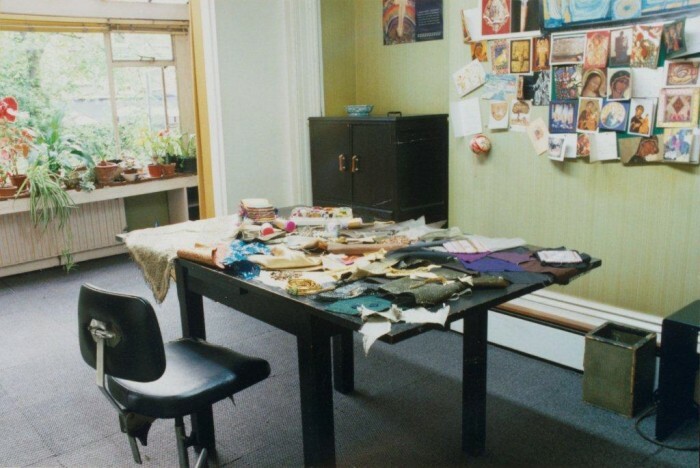 With Renee Hetherington set up a Couture Studio in Pimlico, London. 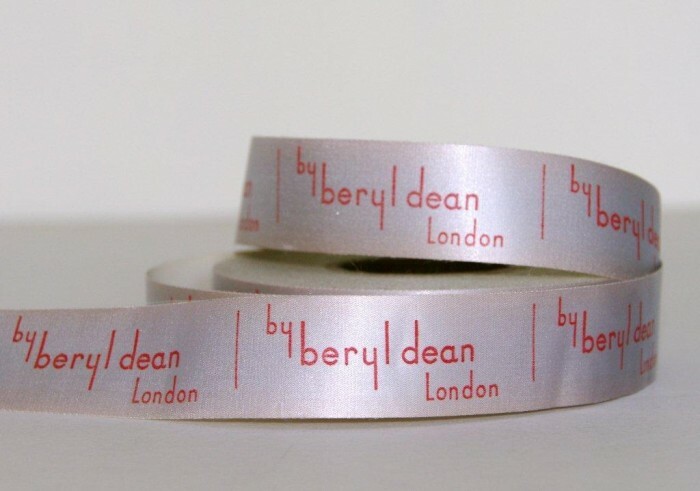 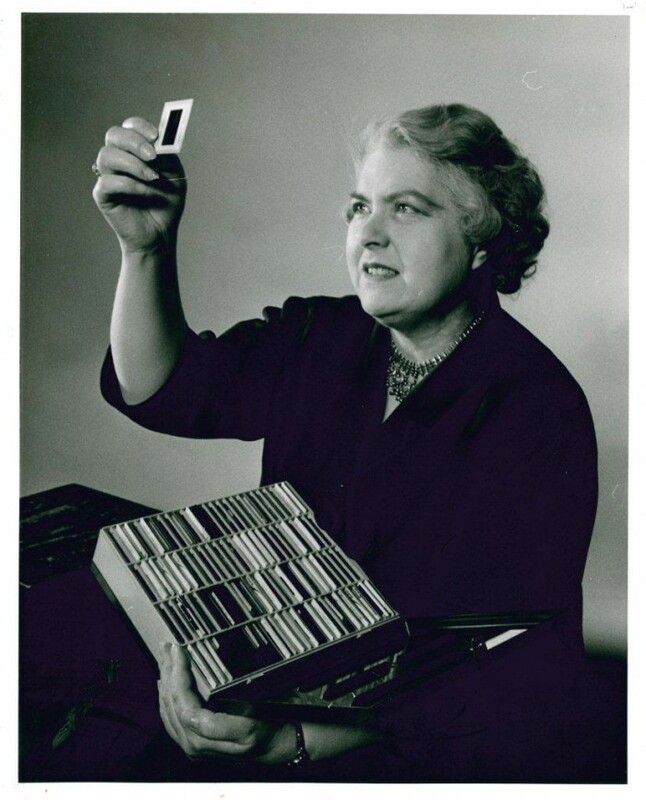 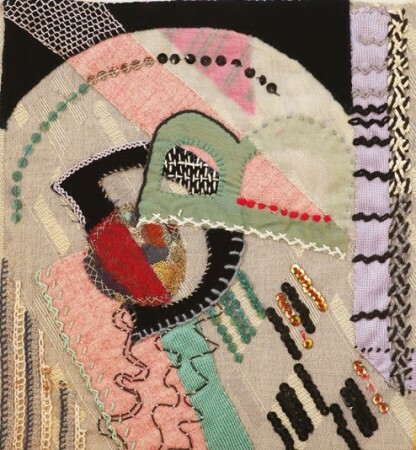 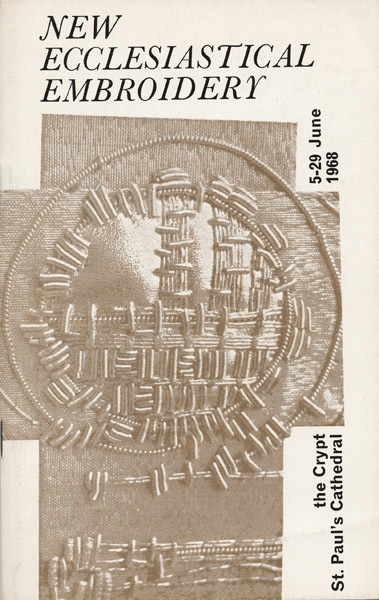 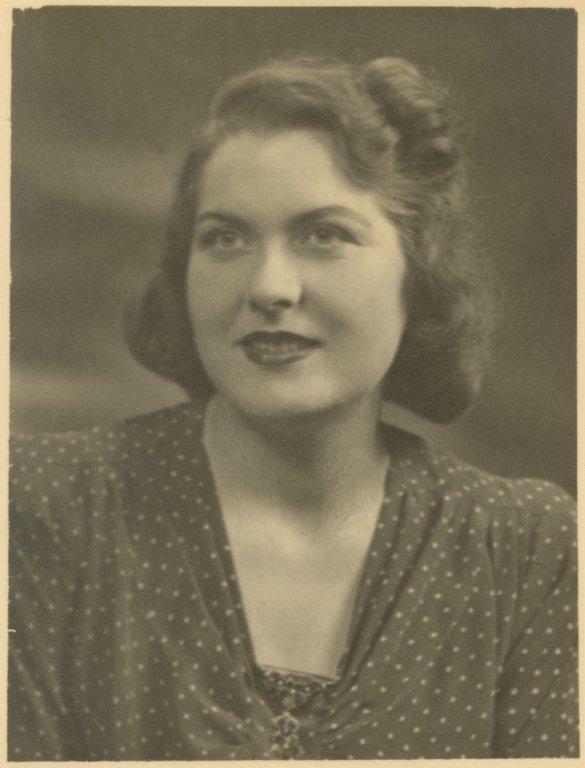 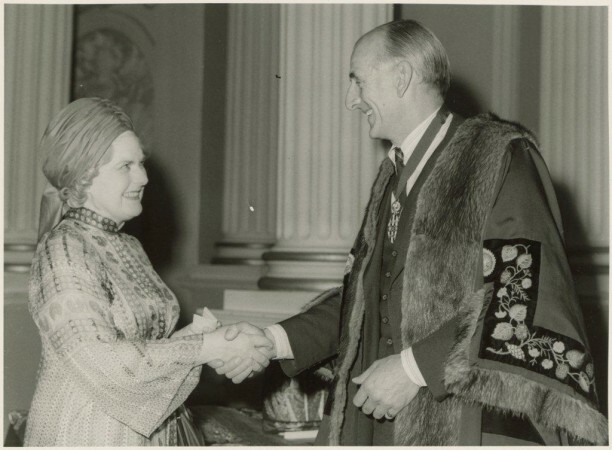 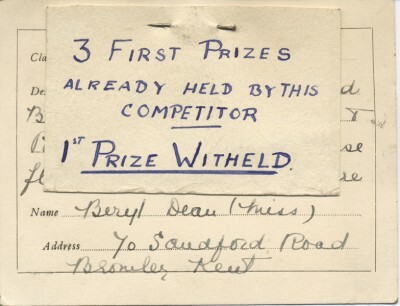 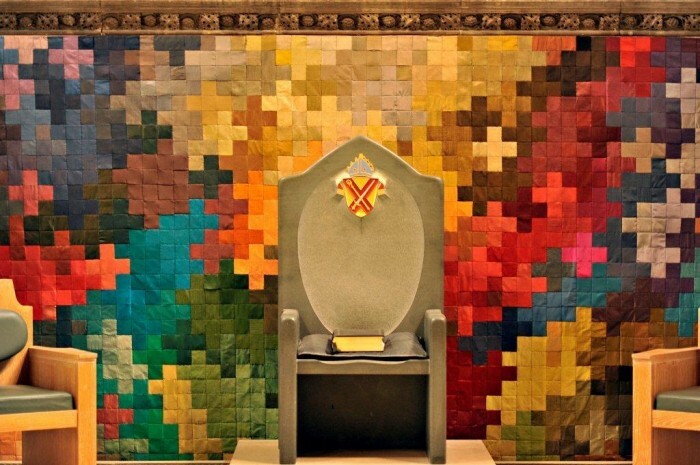 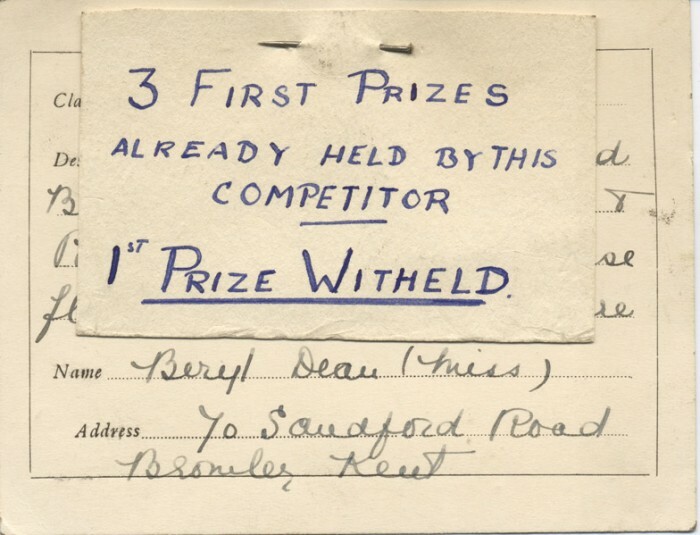 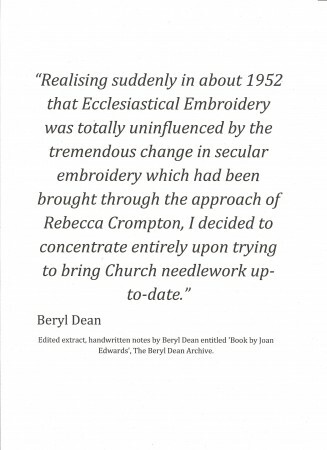 Beryl was commissioned by Dorothy Allsopp, Head of Needlework Development Scheme to make exhibition pieces. Photo © The Beryl Dean Archive, Collection of the V & A Museum. 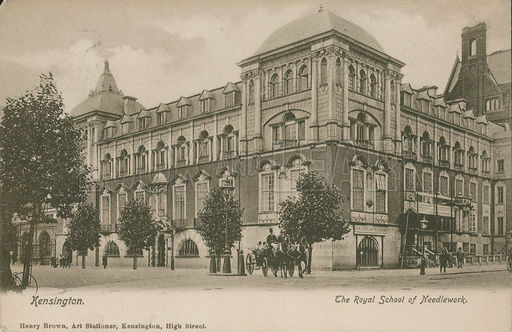 Hammersmith College of Art and Building at Lime Grove, Shepherds Bush, West London. 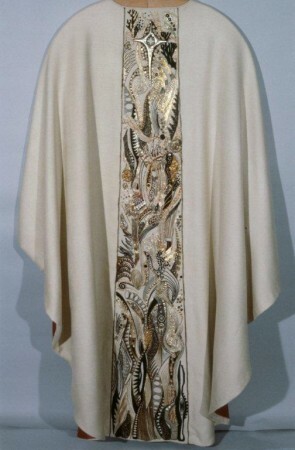 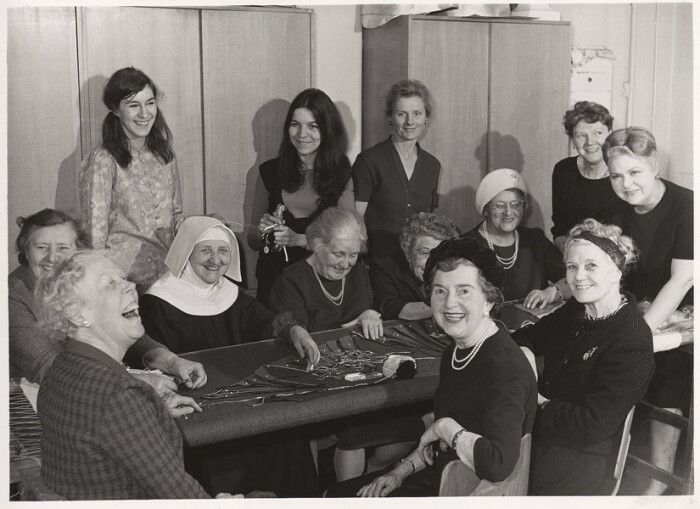 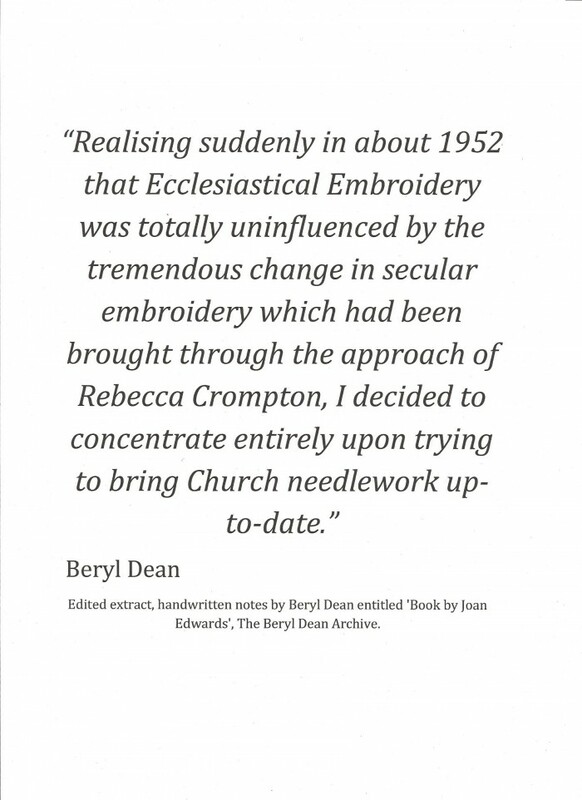 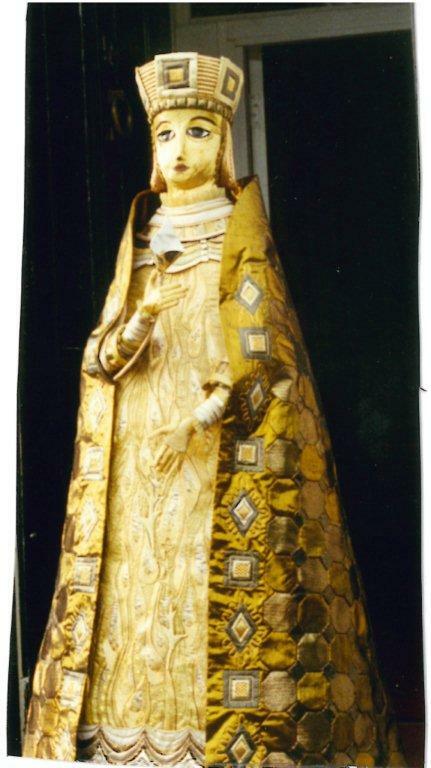 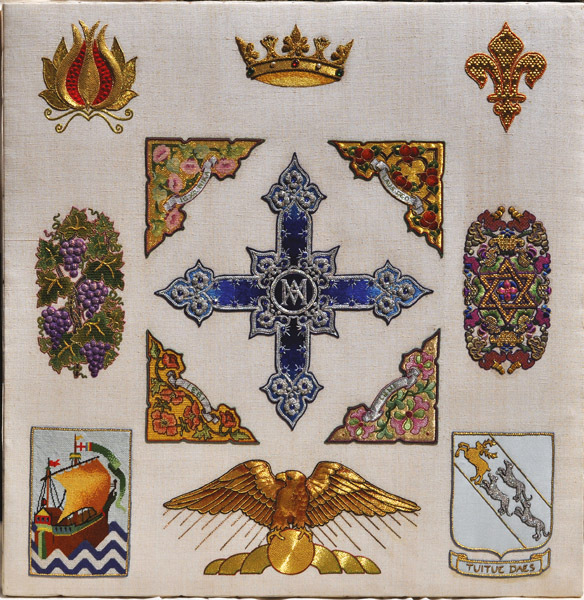 Beryl set up the first Ecclesiastical Embroidery Course and led it for the nexxt 20 years. 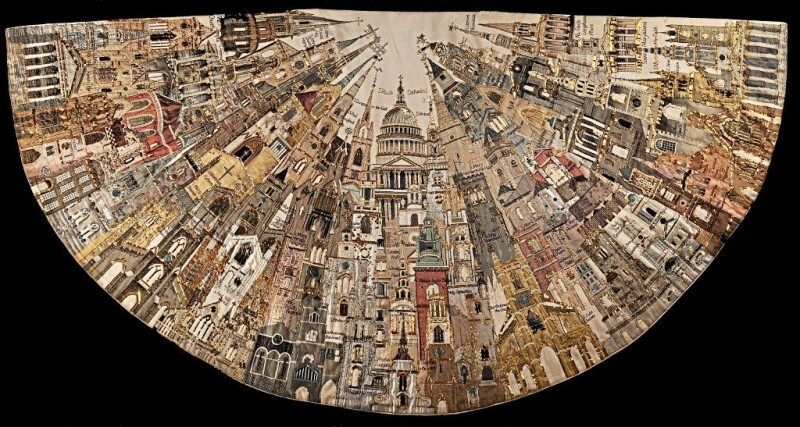 10 Years in the making the Hammersmith Cope, designed by Susan Riley, was a class project, managed by Beryl and gifted to St Paul’s Cathedral. 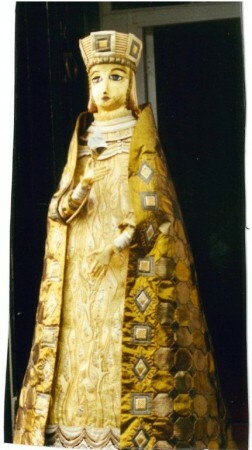 More information on the cope. 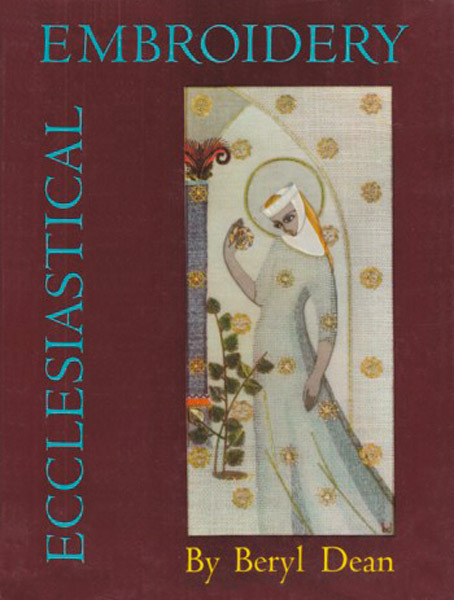 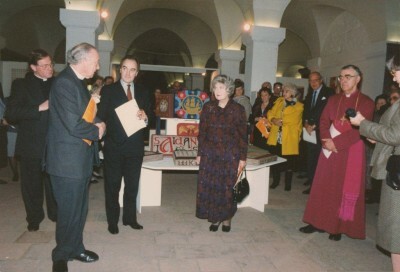 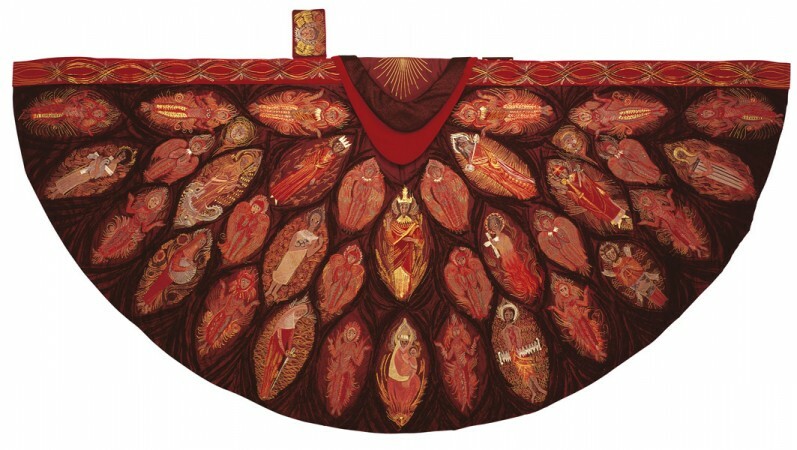 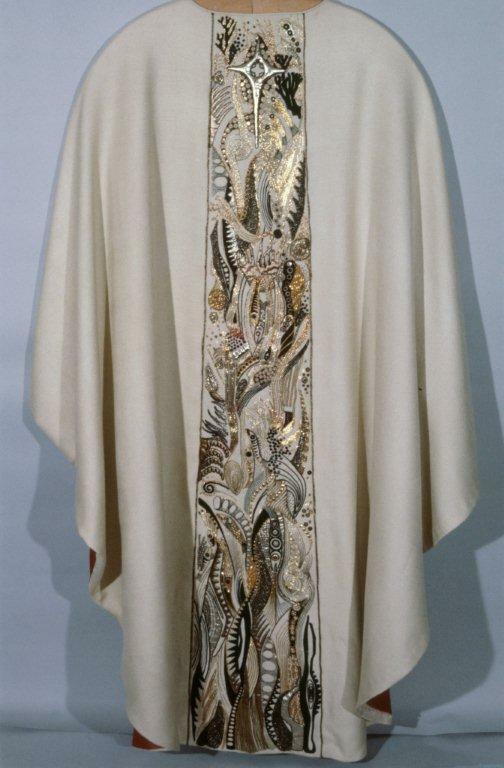 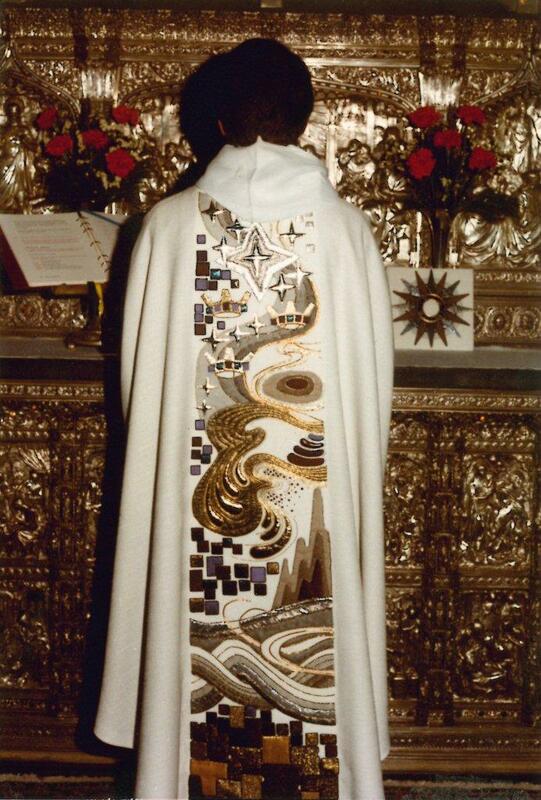 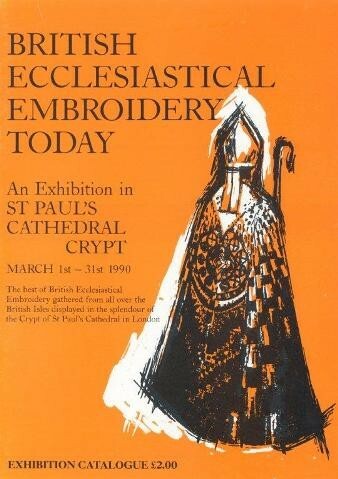 Organised and curated with Constance Howard "New Ecclesiastical Embroidery" Exhibition at St. Paul’s Cathedral. 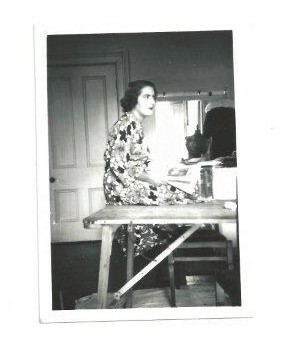 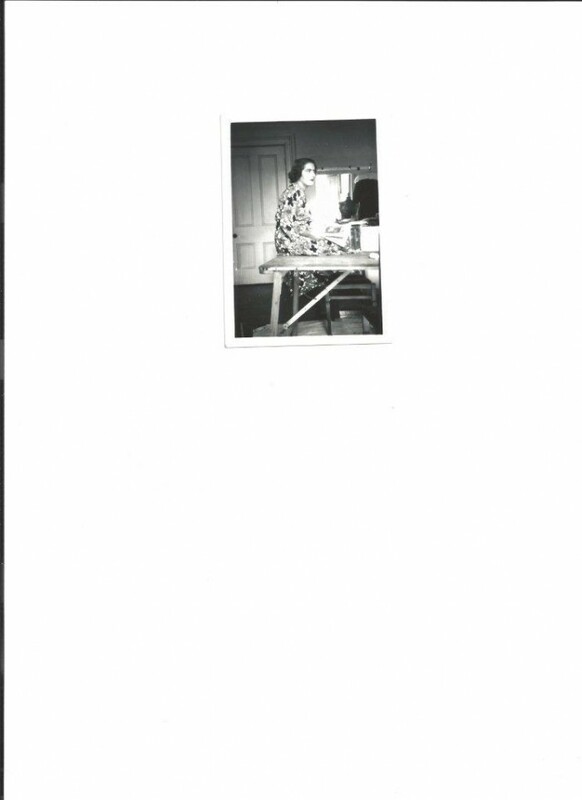 Beryl in her studio at Canonbury Grove, Islington, London. New commission for 5 panels for St George’s Chapel, Windsor Castle. 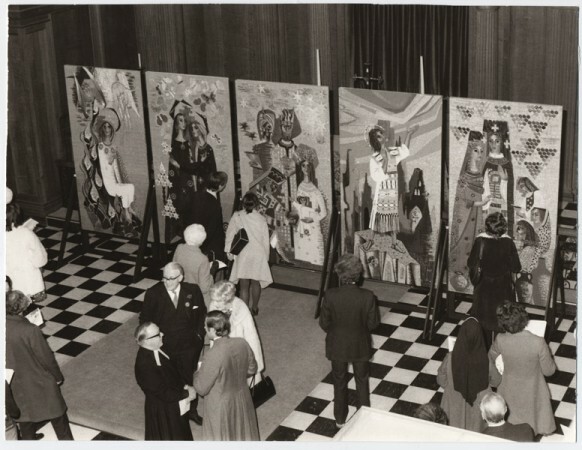 "Beryl Dean and Her Students" Exhibition at St Andrews Church, Holborn. 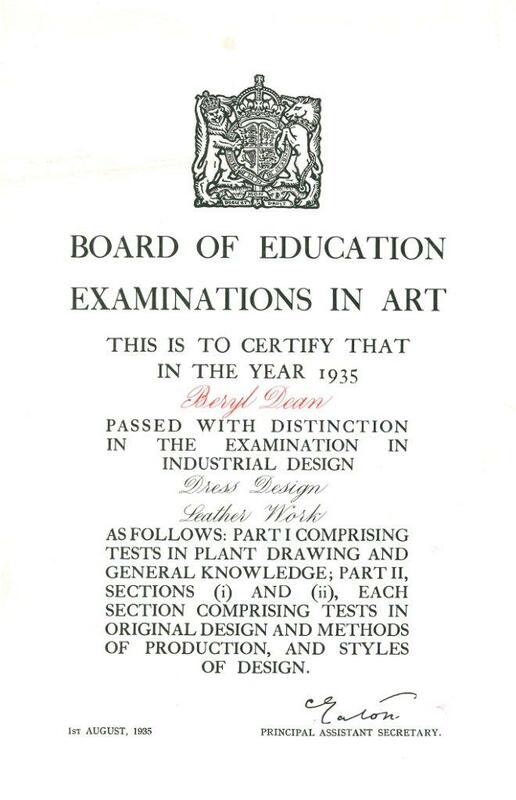 Retires from Teaching to focus on commissions and writing. Enthronement cope and canons copes for Canterbury Cathedral designed by Beryl Dean and worked mainly by Elizabeth Elvin. 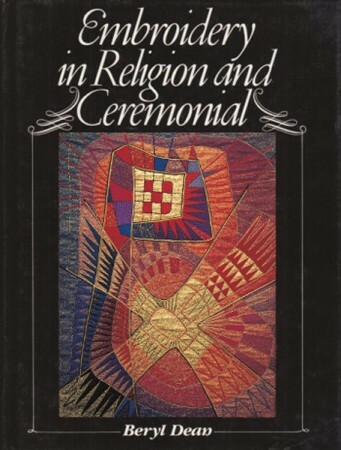 More information. 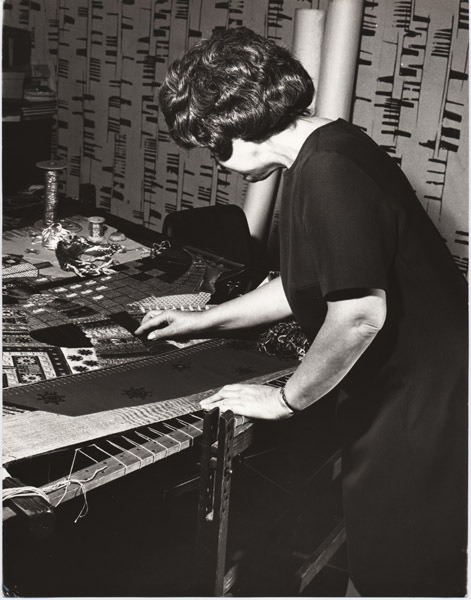 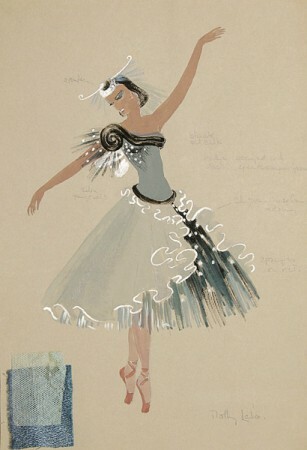 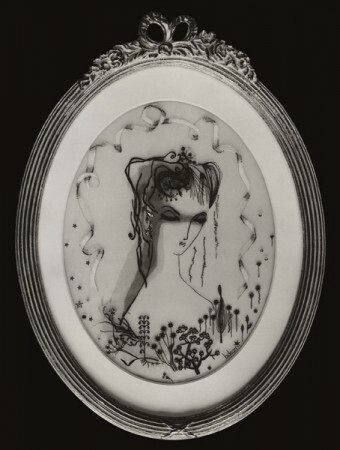 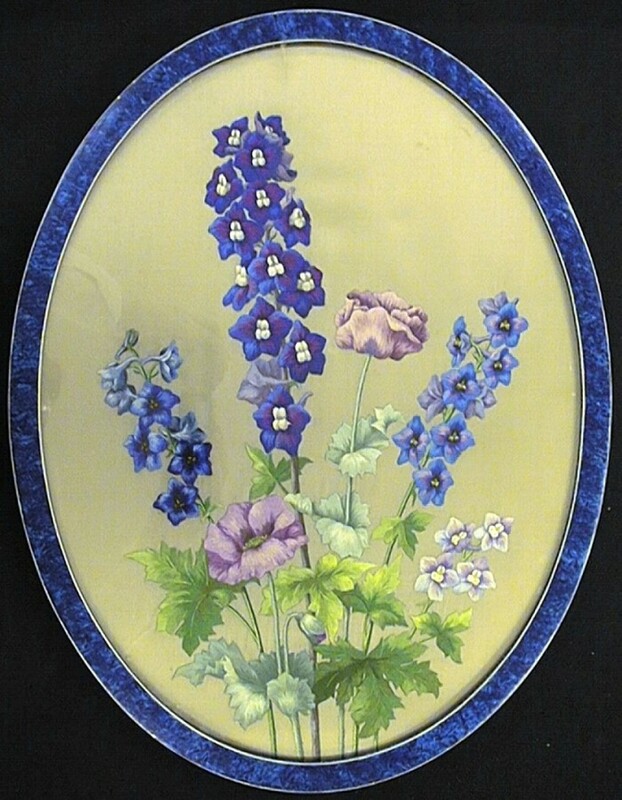 Beryl began work on some of many commissions she had received from the United States. Major commission for 'Cathedral in the Forest', Newland, Forest of Dean, in association with long time friend and collaborator, Sylvia Green. 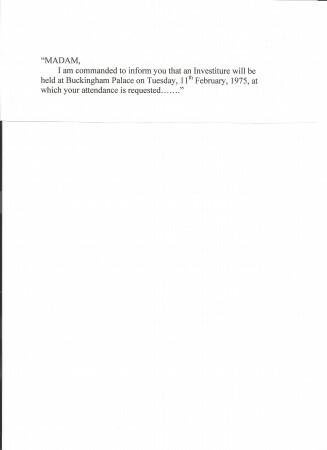 More information. 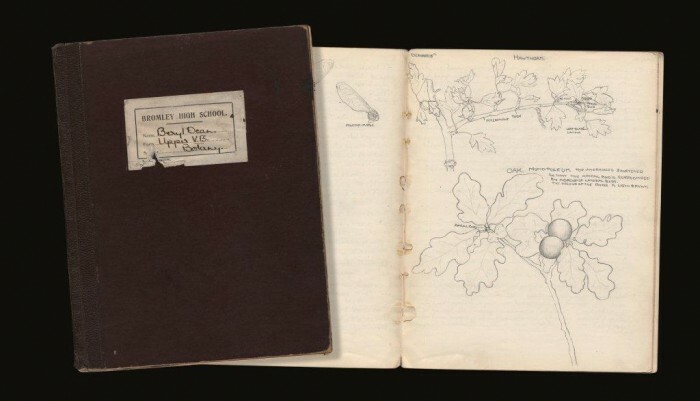 Beryl's last large commission, a sculptural piece, incorporating leather work and using glovemaking techniques learnt in 1933. 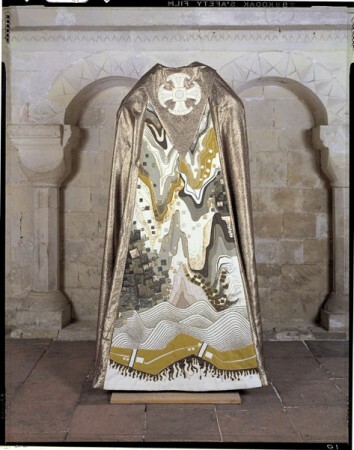 Golden Madonna and Altar frontal for Church of All Saints, East Finchley, London. 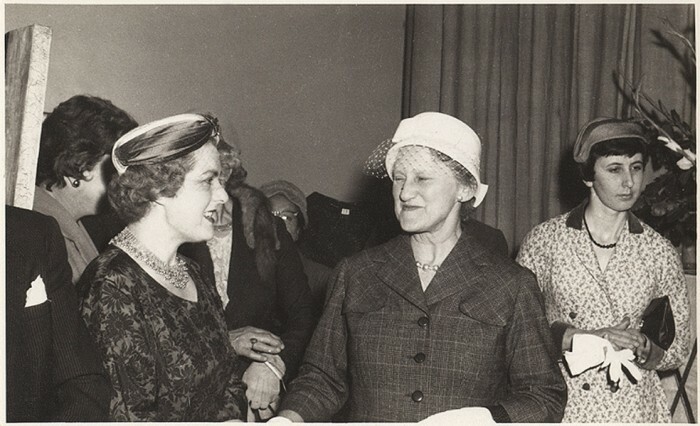 Rebecca Crompton and Elizabeth Grace Thomson: Pioneers in stitchery in the 1930s. Beryl Dean co-authored with Pamela Pavitt and self published with the assistance of Thelma Nye. 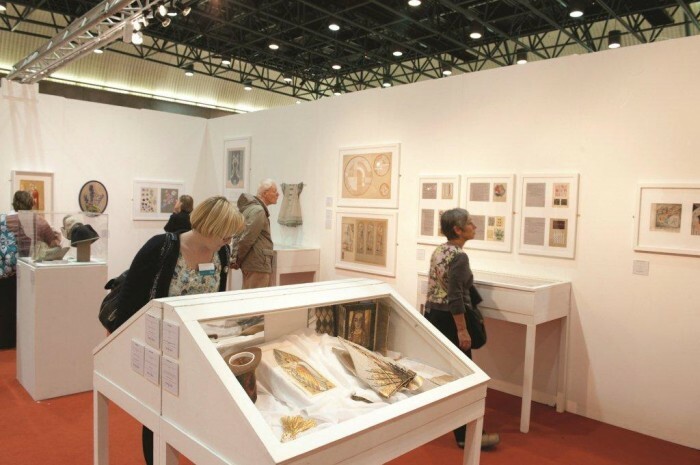 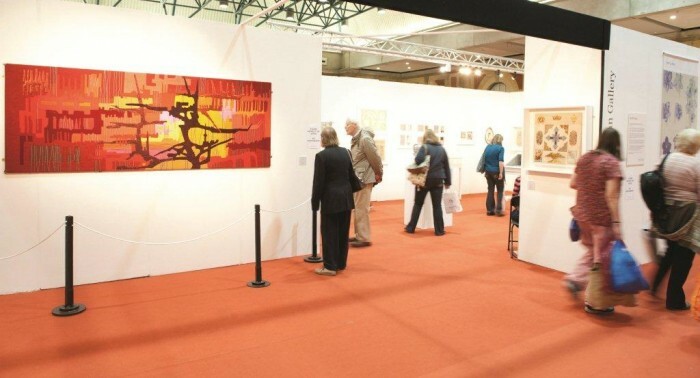 Beryl Dean Gallery at Knitting and Stitching Show, (to mark Beryl’s Birth Centenary) curated by June Hill and Elizabeth Elvin. More information about the Gallery.